Stylish set of four McGuire bamboo rattan dining chairs featuring a rare option lacquered finish. Authentic cathedral style bamboo frames with makers labels. Professionally lacquered by Mcguire in a dark garnet color. The frames are reinforced with leather rawhide strapping and topped with a loose seat cushion upholstered with a geometric black and white pattern. Beautiful reinterpretation of the Classic McGuire style. From an estate in San Francisco, CA. Excellent joinery with age appropriate wear. Spring loaded seats set of four quality dining chairs. New upholstery recommended. 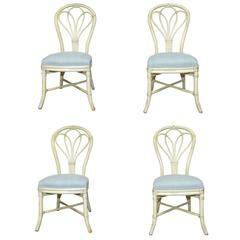 Set of four faux bamboo opera chairs with faux finish.